and heart with peace and prosperity . A very Happy Diwali to all !!!! Diwali is certainly the biggest and brightest of all Indian festivals. merriment , enjoyment , happiness n loads of excitement . cheese/ cucumber triangles on a skewer . amazing work Smita!! really hats off to your creativity!! amazing, mindblowing,superb ;).... i really liked all the work... gr8888.... keep it up. Lovely creations! My kids would love for you to come visit...hee hee! Thanks to all , for visiting my blog n putting in your lovely comments. 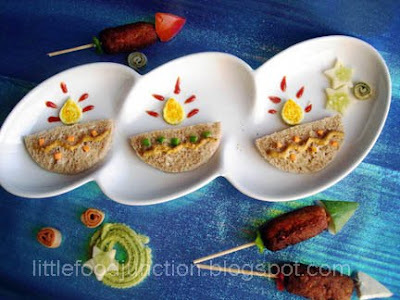 wow, vry creative..was looking for some Diwali fun recipes and stumbled upon ur blog. Happy Diwali! 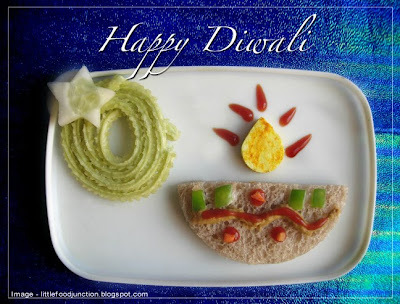 One diwali which I would love to eat.. Good to know that there are still people who would create rather than steal. cool one.. happy diwali y'all.. Thanks for ur valuable comments n encouragement friends !!!! I will surely visit ur blogs Thas n Sudha .. once the festivities r over . I visit food blogs regularly (mainly to look at how creative people get with pictures) and very rarely I comment. Your creations are mind blowing to say the least. I have no creativity at all. But I certainly can enjoy if someone else is creative and I truly enjoy your blog though only first time in yours. Thanks for stopping by my blog n writing such lovely comments . U enjoy creative works & photography which indicates that its present with u too !!!! dear mami wonderful,amazing,creative site. ask all the moms who r in ur reach 2 hav a luk at ur blog. kids will like d food items if they get dem 2 eat. i'l ask my frnds 2 hav a luk at ur blog. im sure they will like it. REALLY CREATIVE! Thanks for visiting n putting in ur lovely comments Aarushi !! Thanks for the kind words n link up Nidhi ! !